LAWRENCE — Featuring music by Mozart and the legendary pursuits and ultimate decline of Don Juan, “Don Giovanni” is widely regarded as the greatest opera ever composed. The KU School of Music and University Theatre partner on this beloved opera featuring the KU Symphony Orchestra. 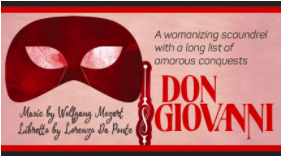 “Don Giovanni” opens Friday, April 21, at the University of Kansas University Theatre. Performances are at 7:30 p.m. April 21, 27 and 29 and 2:30 p.m. April 23 in the Crafton-Preyer Theatre at Murphy Hall. The opera will be performed in Italian with English surtitles. A great opera combines a compelling story with the best of music. As the audience follows the story of Don Juan through his devious schemes and trail of jilted women, the music has Mozart’s characteristic brightness, wit and beauty – shared with music of unusual darkness and passion. The creative team includes Urs-Michael Theus, guest artist, conductor; Kelly Vogel, visiting assistant theatre professor, costume designer; and Dennis Christilles, associate theatre professor and University Theatre artistic director, scenic and lighting designer. Tickets for “Don Giovanni” are on sale now at KU ticket offices and online at www.kutheatre.com. Tickets are also available by calling the University Theatre, 785-864-3982, and the Lied Center, (785) 864-ARTS. Tickets are $22 for adults, $21 for senior citizens and KU faculty and staff, and $10 for children. KU student tickets are $10 in advance, $15 at the door.